To think that just two days ago there had been a hard frost and snow lay on the ground. All of a sudden - and this is an incredible transformation - nature kicks in, as it does each year, and life returns. I walk to the far end of the road, where I meet this fellow, dozing on the warm asphalt. This spring's first frog. 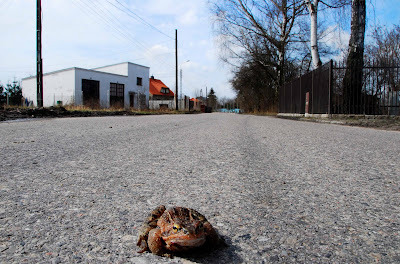 After having its portrait taken, the amphibian is gently removed from the thoroughfare to prevent it becoming roadkill. They're back! A most welcome sight. 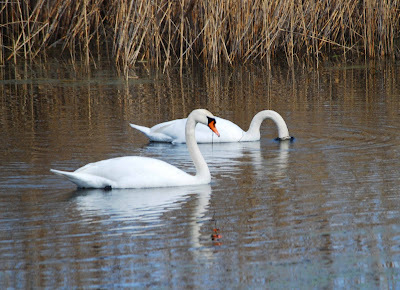 Arriving back in Jeziorki almost a year to the day since their first arrival, a pair of mute swans. I wonder whether their young will also return to their birthplace. It's really good to see the swans again; they must have been happy here last summer. 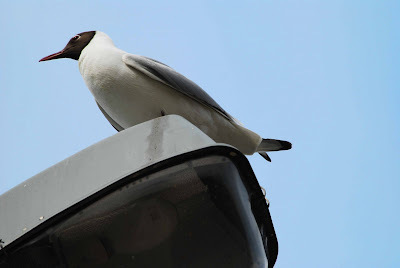 Above: a noisier and more numerous visitor to Jeziorki's reedbeds is the black-headed gull (rybitwa in Polish). Within weeks the skies above the marshes will be alive with the sound of their chatter, the frogs' chorus here being audible a kilometre away. Below: first flowers, by the pond on ul. Pozytywki. 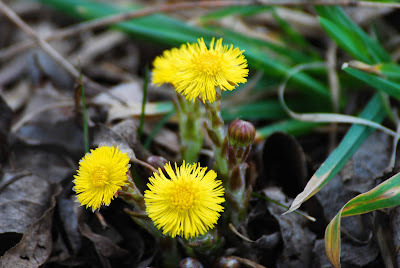 Coltsfoot - Podbiał pospolity - thanks for that one!